Grow Christians is a group blog which tells real stories of families practicing faith at home. Last week our nation witnessed violence which heightened longstanding racial tensions. Then our church read the Good Samaritan story. Many faithful white parents feel called to “go and do likewise” by becoming and teaching our children to be better neighbors to our African-American brothers and sisters. A couple of years ago, Episcopal homeschooling mom and blogger Caris Adel wrote a post describing how she introduced her children to structural racism. Caris has graciously allowed us to republish the post below. The original post is here. – ed. White people don’t do this. We protect our kids. We move into HOAs and put our kids into tons of activities. We shield them from the stove, from tools, from death – from anything that might hurt or upset them. And here I am with a book and m&ms, getting ready to shake their world. Am I doing the right thing in challenging the myth of America with them at such a young age? But in the end I figure if black kids have to have The Talk, and face the unfair realities of the world, then so do mine. So – this is how I introduced the concepts of structural racism and power to my kids, ages 6-13. I explained these concepts underlie everything else we’re going to learn in history this year, and underlies how the world today works. This might look long, but it only took an hour – which is probably too long, but I wanted to get through it all at once. I separated the m&ms into brown, blue, and the rest of the colors. Blue were the landowners/ politicians/rich white people, Colored were the poor/middle class whites, and Brown was black people. The premise was, colored m&ms are better than brown m&ms, because brown look just like chocolate. You can’t tell it has a candy shell, so it’s inferior. I also had a copy of Zinn’s A Young People’s History of the United States and read parts of chapters 2 and 3. On a dry erase board lying flat, I drew Europe, Africa , and America and showed landowners coming over, white indentured servants, and slaves, with the m&ms. We talked about how at first some black people were free and treated fairly equally – some even owned land. And then how the landowners were getting rich and there were the Native Americans, and discontent was brewing in the people. 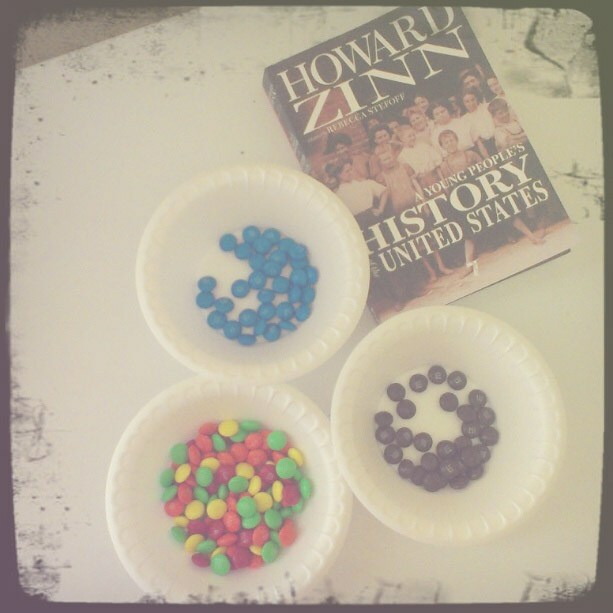 Which led to Bacon’s rebellion, and here we mixed the colored and brown m&ms together and showed how the blacks and whites working together were a threat to the few blue m&ms. And how after Bacon’s Rebellion, white people got corn, money, and weapons, while black people got nothing. We talked about how the leaders were in power and needed to do what they could to keep their power, and as the country formed, who wrote the laws, and who do you think the laws were designed to work for? It’s probably a slight stretch of an analogy, but it got the point across that we depend on people we don’t know to do the dirty work and keep our house in order. Which led into how the north and blue m&ms in general depended on and profited off of the slaves, with the loom industry, etc. I laid out the m&ms in 3 rows – blue on top, colored in the middle, brown on bottom, and talked about how the way of life in general was built on the backs of black people. And then we talked about how that didn’t have to be the case. What if after Bacon’s Rebellion, all the people were given corn, money, and weapons? What if people were paid to work in the fields and treated nicely? Then we jumped to the end of the Civil War and Reconstruction. What do the blue m&ms, and even colored m&ms do with people who have always been controlled? If you believe that brown m&ms are not real m&ms, then of course you have to come up with a way to handle them. So we talked about Jim Crow, and also how most people kept working in the cotton fields, basically as slaves, because if you are poor, uneducated, and know nothing else, what are you going to do? That led a little bit into inheritance and building of wealth and how it was harder for black people to do that. On the whiteboard I drew a road with houses (squares), and in each space put a colored m&m. In the corner I drew squares super close together and put all the brown m&ms up there. We talked about how hard it was to move out of the apartments and inner-city, but sometimes a black family could buy a house (talked about the banks giving worse loans, no loans) and move into a neighborhood. So one brown m&m moved in. And then I gathered the colored residents around the brown house and we talked about how they bombed the house. And then I told them how our realtor tried to get us to live in a white subdivision outside of town instead of where we do, and they were shocked to see that it was real. To finish it up, I talked about how the system is built on the idea that being white is better. That colored m&ms are better. And then I tried to get my oldest to say colored m&ms are better, and she refused because she knew I was making some kind of point. So then I told her she couldn’t have any to eat unless she said it, and instant tears. And kids, that is how power works. We talked about schools – how after desegregation white people withheld their money and support and ended up leaving the schools, because, oh no, what if colored and brown m&ms ended up being friends? And the day before, my 11 yo had pressured the 8 yo into playing a video game a certain way, and I keep telling them ‘you don’t have to listen to him’, and he said ‘but its so hard not to.’ And he cried. So we talked about that – how it’s so hard to stand up to power, and how it’s so easy to misuse what power you have. And then we ate m&ms, and then I saw this story pop up on Twitter and read it to them. Maybe more white people should do this. Have you begun to explain institutionalized racism to your kids? How? Powerfully done, thanks for sharing !! !